Traders seem to have put aside talk of an imminent market pull back at this point, as the trend for stocks continues to point up. And chances are, considering that equities and credit markets keep absorbing new issuance, it could stay that way through the end of September. At 9820.20 Friday, Dow is closing in on 10K sight few anticipated when the major average hit a 12-year low of 6547.05 on March 9. The WSJ has posted an interesting chart which shows the Dow’s 46% surge as one of just six of that magnitude in the last 100 years. 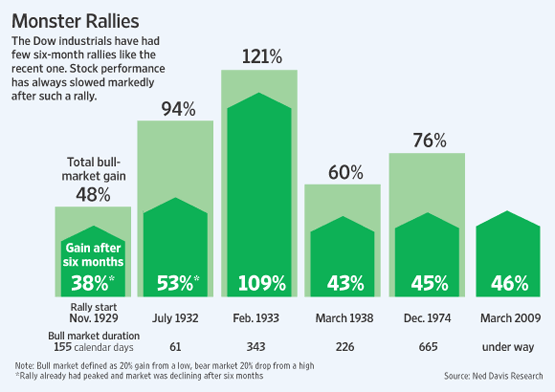 All previous rallies of this magnitude took place in the 1930s and the 1970s.